The Special Educational Needs Code of Practice gives guidance to education settings that helps to identify, assess and provide help for children with special educational needs. It sets out the processes and procedures organisations must or should follow to meet the needs of children. Many of our pupils have specific learning difficulties such as autism or visual impairment, which sometime but not always relate to a specific diagnosis or medical condition, for instance Down syndrome, Prada-Willie, etc. Alfreton Park Community Special School caters for pupils with severe, and profound learning difficulties. Additionally, many of our pupils are on the spectrum of autism and have associated challenging behaviours. Increasingly, we are also meeting the needs of pupils with a range of medical needs. Pupils are identified by the Local Authority as having a learning difficulty prior to entry into the school and placement is in agreement with the Local Authority or the pupils home Local Authority. We base all education on person centred approaches involve parents and pupils in the planning of individual learning plans as far as possible. The pupils annual review of progress is an opportunity for parents, pupils and all professionals involved to join together to discuss pupil progress and future learning needs. Pupils may progress through the school from 3-19 years and we strive to ensure that effective transition arrangements are in place at each phase; pupils and parents being supported particularly on entry to school and transition to post 19 provisions. Our family support worker plays a crucial role in these transition arrangements. Additionally, we work closely with the careers personal advisor to ensure that effective college placements are provided and movement into adult services as appropriate. Our Youngest pupils follow the Early Yeas Foundation Stage curriculum and are assessment within this framework. This curriculum is based on developing skills through play and exploration. As pupils move through the school we follow a personalised curriculum that covers all subject within the National Curriculum for Primary schools but is based on meeting the learning needs of individual pupils taking into consideration their strengths, needs, interests and individual learning styles. Many pupils need highly specialised approaches to meet their learning, physical, social and emotional needs. Our older pupils follow a curriculum that is focused on ensuring that all pupils are as independent as possible and are prepared for their next steps toward adult life. We strive to give all pupils access to the learning activities across the school and ensure that pupils access a wide range of learning activities and environments including visits foreign countries, outdoor learning opportunities and use of the community to develop independence skills. Activities such as Forest Schools, and close working relationships between pupils and staff foster supportive environment where all individuals feel valued and able to develop socially and emotionally. An active school council support pupils in feeling listened to. The school very much embraces individuals ‘differences’ and support all members of the school community to support each other. Bullying is limited and any incidents are dealt with immediately. Multi-agency working is intrinsic to the working of the school and partners from health, social care and other voluntary organisations are a highly valued part of the support we provide to pupils and their families. Parents are encouraged to participate in developing individual learning plans for their child and have an active voice in the provisions made. We recognise that children make progress at different rates and have different ways in which they learn best. Teachers take account of this by looking carefully at how they organise their lessons, the classroom, the resources they give to each child and the way they teach. So all teachers consider a number of options and choose the most appropriate ways to help each child learn from a range of activities. This is often described as ‘differentiating the curriculum’. Parents may contact the Headteacher – Cheryl Smart or Sharon Walker Family Support Worker. Alternatively, the child’s class teacher is happy to discuss any day to day concerns. We will consult parents about all the decisions that affect their child. If you, as a parent have concerns or worries at any time, you should share them with your child’s teacher or head teacher or any other professional working with your child. We also assess progress in areas other than attainment for instance where a pupil needs to make additional progress with wider development or social needs in order to make a successful transition to adult life then we would put in extra interventions and support to meet those needs. Consideration of what special educational provision is required starts with the desired outcomes, including the expected progress and attainment and the views and wishes of the pupil and their parents. This then helps determine the support that is needed and whether it can be provided by adapting the school’s core offer or whether something different or additional is required. The outcomes considered include those needed to make successful transitions between phases of education and to prepare for adult life. We take action to remove barriers to learning and put effective special educational provision in place. This support takes the form of a four-part cycle (assess, plan, do, review) through which earlier decisions and actions are revisited, refined and revised with a growing understanding of the pupil’s needs and of what supports the pupil in making good progress and securing good outcomes. This is known as the graduated approach. It draws on more detailed approaches, more frequent review and more specialist expertise in successive cycles in order to match interventions to the children and young people. Staff are alert to other events that can lead to learning difficulties or wider mental health difficulties, such as bullying or bereavement. Such events can have an impact on well-being. We ensure appropriate provision is made in order to prevent problems escalating. Teachers are responsible and accountable for the progress and development of the pupils in their class, including where pupils access support from teaching assistants or specialist staff. High quality teaching, differentiated for individual pupils, is the first step in responding to pupils. Our approach to record keeping is in line with the requirements of the Data Protection Act 1998. The provision made for pupils is recorded accurately and kept up to date. As part of any inspection, Ofsted will expect to see evidence of pupil progress, a focus on outcomes and a rigorous approach to the monitoring and evaluation of support provided. 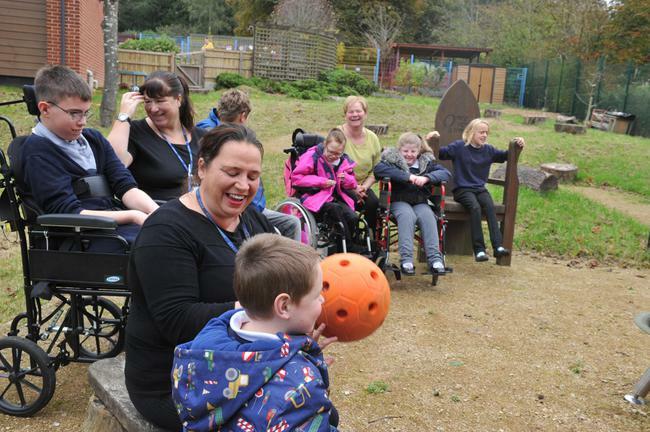 Pupils with specific needs will often have other specialists involved such as Speech and Language Therapists, Physiotherapists and Occupational Therapists. They will often work with our school staff to enable our staff to carry out suitable programmes under the guidance of the therapist. All of our pupils will have statement prior to entry and these will shortly be converted into EHC plans. If parent require changes to a statement of EHC they can make a request to the school for this to place where there is a change in the pupils needs or provision required. As young people prepare for adulthood outcomes EHC plans should reflect their ambitions, which could include higher education, employment, independent living and participation in society. To support transition, we share information with the school, college or other setting the child or young person is moving to. We agree with parents and pupils the information to be shared as part of this planning process. We recognise that children make progress at different rates and have different ways in which they learn best. Teachers take account of this by looking carefully at how they organise their lessons, the classroom, the books and materials they give to each child and the way they teach. So all teachers consider a number of options and choose the most appropriate ways to help each child learn from a range of activities. This is often described as ‘differentiating the curriculum’. We ensure Teaching Assistants are appropriately prepared and trained to support the curriculum, and that pupils are not separated from the curriculum as a result of being supported by a Teaching Assistant. Teaching Assistants work in teams lead by a teacher to provide in all aspects of teaching and learning and in supporting pupils health and hygiene needs. We provide for pupils with high incidence requiring low cost, non-customised equipment, e.g. non customised ICT equipment. For more specialist customised equipment Derbyshire LA provides funding for an Individual Children’s Equipment Budget to meet these needs. The school staff are highly trained and possess an expertise in supporting children and young people with SEN. In house and external training is ongoing to ensure that all staff have the skills to meet the educational, medical, social and emotional needs of our pupils. We aim to train all staff in areas such as TEACCH, PECS PROACT-SCIPr-UK®, Makaton and other teaching strategies used across the school. The school takes part in a rigorous self-evaluation process which is quality controlled by the Local Authority. School improvement plans address any areas for development and these are regularly monitored by the governing body. Interventions used with individual are regularly reviewed as part of our assessment and review cycle. 6.80 The above should include arrangements for supporting children and young people who are looked after by the local authority and have SEN. The school plans for Looked after Pupils and individual Pupils Education Plan are reviewed to meet the statutory framework for this. 6.81 Schools should ensure that the information is easily accessible by young people and parents and is set out in clear, straightforward language. It should include information on the school’s SEN policy and named contacts within the school for situations where young people or parents have concerns. It should also give details of the school’s contribution to the Local Offer and must include information on where the local authority’s Local Offer is published. Add in a link to the website. 6.82 In setting out details of the broad and balanced curriculum provided in each year, schools should include details of how the curriculum is adapted or made accessible for pupils with SEN.
6.83 Schools should also make data on the levels and types of need within the school available to the local authority. The data will be required to inform local strategic planning of SEN support and to enable the local authority to identify pupils who have or may have SEN. Such data, collected through the School Census, is also required to produce the national SEN information report. School procedures dealing with complaints from parents of children with special educational needs (SEN) about the support the school provides. The school takes all complaint seriously and complaints from parents of children with special educational needs (SEN) about the support the school provides should initially be taken to the Headteacher who will consider the complaint and potential remedial activities. The Headteacher will respond to the parent within 2 weeks. The Headteacher should consider the pupils needs within the context of the financial and logistical limitations. Consideration of transparency and equality in provision must be made to ensure that all pupils are treated fairly and without prejudice. The Headteacher will consider the individual Pupils EHC plan and parents may request a reassessment of needs if required. Parent should be made aware of the procedures in place for personal budgets and EHC plan requirements. Parents have the right to appeal and any such appeals should betaken to the governing Board in writing.